It is said that the best journey is one which takes you back home and well looks like Kartik Aaryan can explain this best. The actor who will begin shooting for Dinesh Vijan’s Lukka Chupi set off for the first schedule of the film last evening. Surprisingly the film is being shot in Gwalior which happens to be Kartik’s hometown. The actor who’s born and brought in Gwalior couldn’t control his excitement when he learnt about the first schedule of the film, but he had no idea that people from Gwalior were more excited than him. Yesterday when he landed in his hometown, Kartik was surprised to notice his posters on the road, giving him a warm welcome. The actor was already elated with the posters, when he further reached the UKP Main Gate he was shocked to see his fans waiting for him with garlands and bouquets for him. The humble actor that he is, Kartik loving accepted the flowers and even clicked selfies with them. He was really taken aback with the love and affection he got in his hometown and his parents were feeling really proud about him. But what really touched the rising superstar was the fact that some special students from a blind school were present there to welcome him back home. 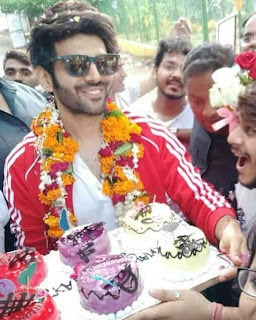 They performed to his hit songs and a blind girl even sang for him... Now this gesture really made Kartik Aaryan's journey back home special! Kartik will be in Gwalior for 50 days along with his co-star Kriti Sanon. It is said that he will be playing the role of a local TV reporter in the film. Last week the first look of the film went viral on social media and broke the internet, where we see Kartik and Kriti as the groom and bride and all in love. Now we just can’t for yet another entertainer from Kartik Aaryan.